Evergreen Pneumatic Rubber Fenders (Floating Yokohama Marine Fenders) is a leading anti-collision device for marine application in the world today. This compressed air rubber fender is used as a protective medium. Therefore, pneumatic rubber fenders serves as a critical protective medium against collision when ship-to-ship (STS) transfer operations and ship-to-dock (STD) berthing and mooring operations. Floating Pneumatic Rubber Fenders has the advantages of massive energy absorption with low unit surface pressure acted upon the ship. So floating pneumatic fender has become an ideal ship protection medium used extensively by large tankers, LPG vessels, ocean platforms, bulk carriers and floating structures, large docks, harbor and wharfs. 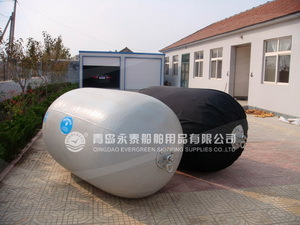 Floating pneumatic rubber fenders, constructed by out rubber, inner rubber, Synthetic-tire-cord, beading ring, flange opeing, safety valve, metal accessories, are kind of a cylindrical air bags with hemispherical heads at both ends. All of these are vulcanized together, and then compress air inside to enable in to float on the water. The fender is covered by a protection net consisting of either chain, wire or fiber and usually with tires or rubber sleeves. The fender is designed to be used without a protection net. It’s easy to hand because of their lightweight. Because of the multiformity of application, Evergreen adjust our design in order meet the clients various requirements, such as net variations, colors variations, and end fitting variations. Evergreen Management System is certified ISO 9001-2000 and follows each order during manufacturing procedures. Evergreen guarantees high standards and performances of all products. Customer requirements are strictly followed during all production phases. Evergreen relevant departments assure a procurement control on the raw and basic materials. Evergreen are very focused on the quality of our marine fenders. 100% pneumatic marine fenders should be tested and inspected as per the requirement of ISO 17357. Non conformed products are immediately rejected by Quality Control. The widely usage have been tested under rough condition. Our many satisfied customers are out best reference. Evergreen welcomes inspection by its customer’s quality assurance departments and to their appointed agencies as CCS, Lloyd’s, DNV, or ABS. Please contact us to get more information about How to Application, Marine Fender Selection, Repair Kits and Spare Part, Other More Details about our Floating Pneumatic Rubber Fenders (Yokohama Marine Fenders).